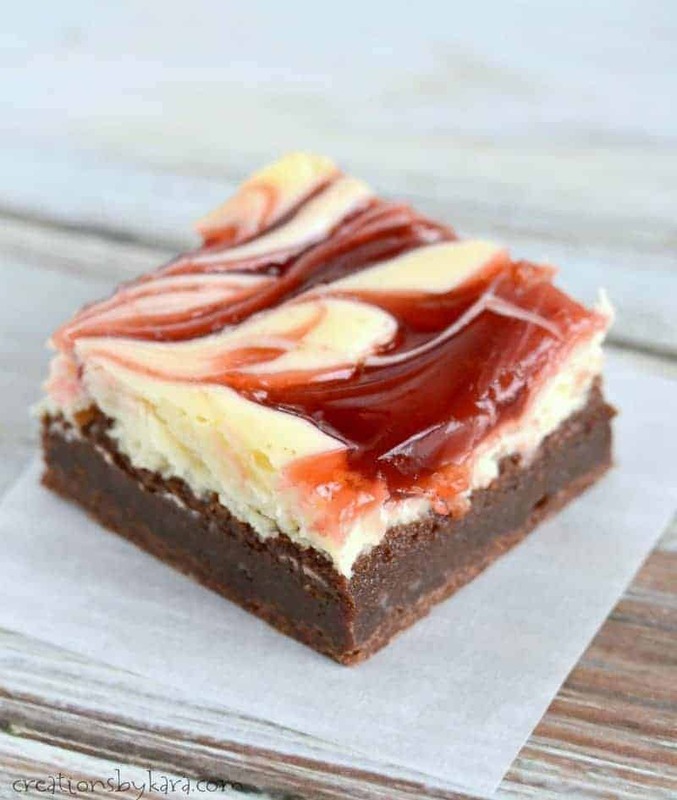 Guys, these brownies are epic. I mean come on . . . three layers of decadence all packed into one treat. You just can’t go wrong. Every single bite is scrumptious! I love the combination of brownies and cheesecake. 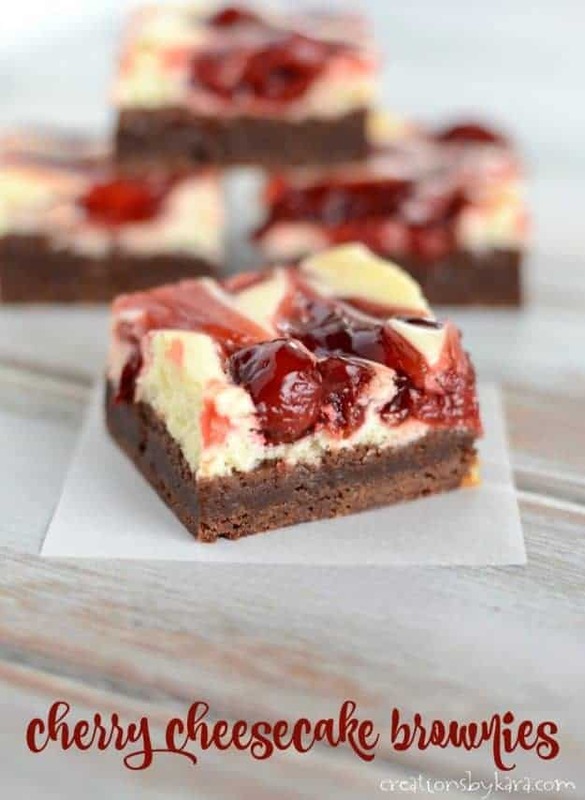 My Oreo Cheesecake Brownies are a favorite. But I’d never tried a cherry version. I bookmarked this recipe months ago, and I waited way too long to actually make them. They are definitely a new favorite! They are simple to make, and they turn out so pretty with the cherry swirl on top. They are sure to be a crowd pleaser. I know I had a hard time resisting them. 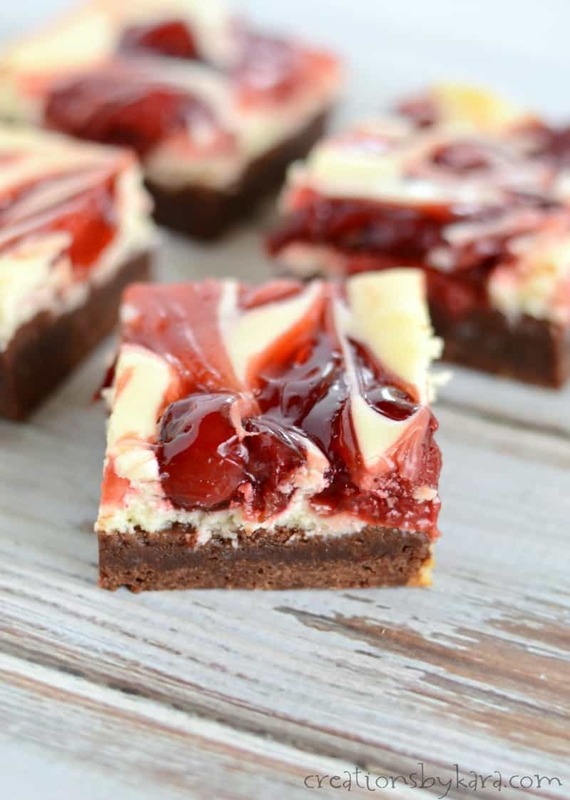 Rich and fudgy brownies topped with cream cheese and cherry pie filling. Whisk together melted butter, sugar, and cocoa till smooth. Whisk in vanilla and eggs. Stir in flour and salt till well combined. Pour into a well greased 9x13" pan. Beat cream cheese and sugar till smooth. Add egg and vanilla, beat till smooth. Pour over brownie layer. Drop cherry pie filling by spoonfuls over the cream cheese layer. Swirl with a butter knife. Bake at 350° for 45-50 minutes or until middle is barely set. Cool completely before serving. 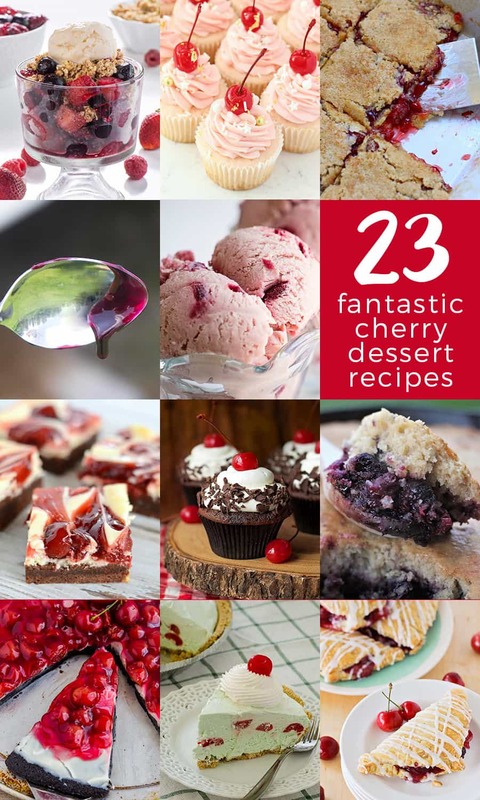 Today is National Cherry Dessert Day, so I’m back with my fellow food bloggers to share even more incredible cherry recipes. As usual, they have me drooling. Hope you’ll try a few of them! I just store them at room temperature in an airtight container (if we have any leftovers). If you prefer you can store them in the refrigerator. 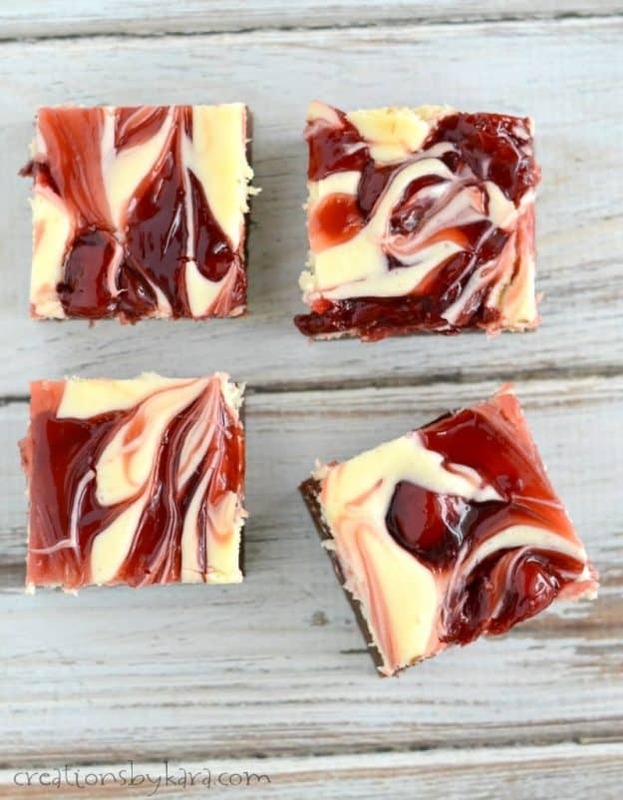 I haven’t tried it, but my guess is that the cherry pie filling would turn the cheesecake soggy when it thawed. You could always try freezing one to see if it works. 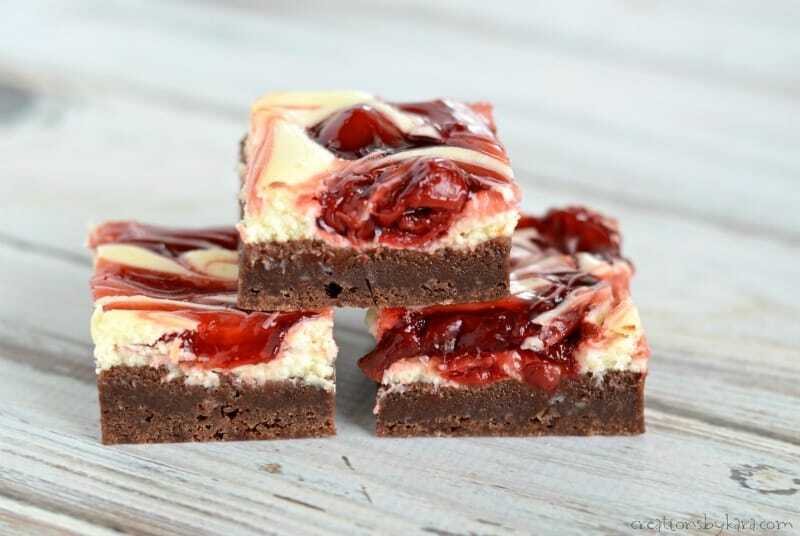 These Cherry Cheesecake Brownies are so yummy and pretty to look at too. They were easy to make. My friends took all of the leftovers home. 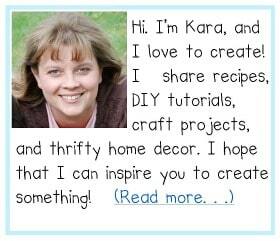 So I’ll have to make some more for my family. Great dessert. I wish I would have heard of them sooner. They are seriously amazing! I’m dying to have one!